Visual Art 1 provides a comprehensive introduction to visual arts at the high school level. Visual Art 1 is a prerequisite for the other visual art courses offered at BHS. The purpose of this course is to introduce students to a variety of art making and media that will inspire students to look within themselves and discover ways they can impact others. You must have your sketchbook in class everyday! Lost yours or it fell apart? Buy a new one!! Stay in your seat until the bell rings!!! No getting books before the bell. No cleaning up before Mrs. Barge says to clean up. Follow my rules for a happy classroom and teacher! Thursday and Friday - BREATHE days. You can rework your Aboriginal art or 2-pt. perspective project for a regrade. Due Friday at the end of the period. Create three ATC's for your post-test. These will count as 50% of your Benchmark grade. I must see improvement from your previous cards. They are due at the end of the period on Monday, April 15th. Sketchbook #6 - Markers, due Friday, April 19th. Want to get a 100 on your sketchbook? Fill the page, have a foreground, middle ground, and background, and spend time on it! ​Winter Break. Have a great week! 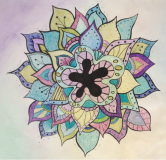 Quiz over composition, mixed media, triptych, Zentangle, and patterns on Friday.